ROANOKE, VA. — Former Cleveland Indians and Philadelphia Phillies manager, Charlie Manuel, has been named the guest speaker at the 24th annual hot stove banquet where five area baseball players and contributors have been selected for induction into the Salem-Roanoke Baseball Hall of Fame. The event will be held on Thursday, Jan. 29, 2015 at the Roanoke Civic Center. Source: Roanoke.com. 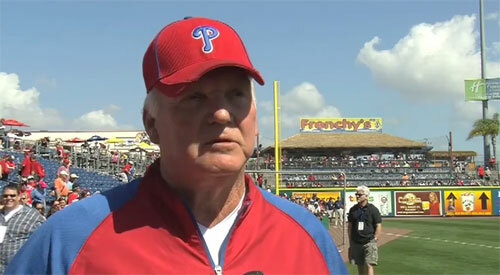 Photo shows Charlie Manuel speaking with WEBN-TV Boston in a 2012 interview. Among the new inductees are former Northside and Radford University star Kelly Dampeer, American Legion Coach Cecil Doss, local umpire Ben Minton, along with Alleghany High School Coach Gary Rice and Bob Scarborough who had a successful career at Ferrum and in the Indians organization. Charlie Manuel is the former manager of the Cleveland Indians and Philadelphia Phillies, winning the 2008 World Series with the Phillies. He was inducted into the Salem-Roanoke Baseball Hall of Fame in 1995. Sports Speakers 360 is a booking agent for pro athletes. If you would like to book Charlie Manuel for a speaking engagement, appearance or endorsement, contact Charlie Manuel’s booking agent for fees at 1.855.303.5450.